The idea seemed silly at first. 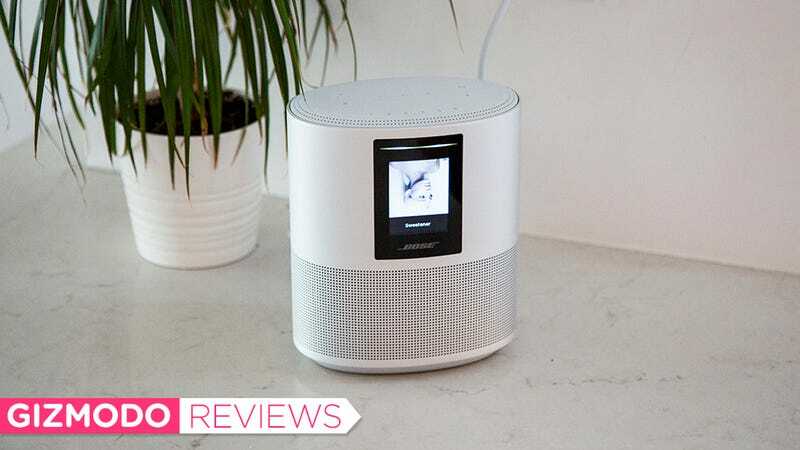 Bose made an Alexa-powered wireless speaker with a little screen, a big $400 price tag and a promise “to fill any room with an astonishing stereo performance.” I’ve been using the Bose Home Speaker 500 for a little more than a month, and there are a few things I don’t like about it. But it sure does sounds great. I’m tempted to say that the Bose Home Speaker is the best sounding Echo alternative yet, but that would be irresponsible. I have not heard them all. I have spent a lot of time with other Alexa-powered speakers like the Sonos One, the UE Megablast, the Riva Concert, and every Echo model. Until now, I would have argued that the Sonos One carries the crown of the best sound. The Bose Home Speaker is better, and it pains me to admit it because otherwise, it’s just not a great gadget. One of the most noticeable things about the new Bose speaker is the size. It’s beefy at eight inches tall and nearly seven inches wide, and the device asserts itself with its oval shape, which doesn’t fit neatly into a corner or blend in with a wall. Meanwhile, with its sleek aluminum body, the speaker is almost attractive, except for this weird LCD screen slapped on the front of the thing. Best I can tell, the screen exists exclusively to show album art and display the time when the speaker is in standby mode. Maybe it will do more in the future! “Maybe it will do more” is a running theme for the Bose Home Speaker 500, in general. It’s hard for me to look at the Bose Home Speaker without thinking about the iconic Bose Wave Radio of early 1990s infomercial fame. This isn’t because Dr. Amar Bose has invented a new acoustic enclosure for wireless speakers. Dr. Bose died in 2013. However, the eponymous company that he founded is doing something a little bit different with the new Home Speaker 500, while paying tribute to its past. The speaker has two drivers that shoot music out the sides of the speaker with the goal of bouncing sound off the walls. That’s the good part. However, the speaker also features clunky controls—including six preset buttons just like the ones on the old Wave Radio—and limited compatibility with other sound systems. Those are the bad parts. First of all, the controls are too complicated. There are 13 buttons on this gadget, all of which are touch sensitive and none of which offer any haptic feedback. So it’s next to impossible to tap one without doing a bit of hunting and pecking. And although they’re a sort of homage to an older generation of Bose design, the six presets don’t make a ton of sense. You can program them to play a Spotify playlist with one touch. But who wants six playlists on demand, and furthermore, who can remember what all of them are? On top of that, they’re positioned so close to the edge of the speaker that I found myself pressing the presets accidentally any time I moved the thing. The sound quality is great, though. I can’t say that enough. In a side-by-side test, the Bose Home Speaker 500 blew my Sonos One out of the water, and the huge soundstage that it produced sounded more like my Sonos Play:5 in a similar test. The Bose speaker’s bass response was not as good as the Play:5's, but you wouldn’t expect it to be since the Bose speaker is less than half the size of the big Sonos. The tuning of the Home Speaker 500 also offers a pleasantly balanced sound. The acoustic guitar sounds especially acoustic, for instance, on Iron and Wine’s “Naked as We Came.” On the other end of the genre spectrum, the synths and kick drum on “First Time” by Kygo and Ellie Goulding sound massive like you’re standing in a concert hall. This might be good news for someone like me, who lives in a small apartment and might just need one speaker for the whole home. However, if you’re looking for a multi-room solution or adding to an existing system, things might get tricky with Bose Home Speaker 500. The Alexa-enabled speaker should work with the rest of Bose’s new smart speaker lineup, including the Bose Soundbar 500 and the Bose Bass Module 500, through the new Bose Music app. You can create groups of speakers and listen to the same audio on all of them at once, just like you can with a Sonos system. 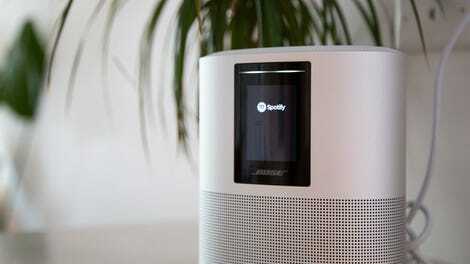 However, the Bose Home Speaker 500 does not currently work with the previous generation of SoundTouch speakers, which use a different app, or other Alexa-enabled speakers, like the Amazon Echo family. It’s not unique for a wireless audio system to be restrictive. Sonos, for one, has a famously restrictive ecosystem, so much so that its speakers don’t even offer the ability to play audio via Bluetooth. The Bose speaker does offer Bluetooth capabilities. The company also says it will add AirPlay 2 in early 2019. It’s unclear if the company plans to add Google Assistant capabilities. Bose hasn’t been sufficiently transparent about the Home Speaker’s lack of compatibility with its older products, and that’s lame. It’s a usability issue that has already upset a lot of loyal Bose fans. Meanwhile, the button issue would be something that I could ignore on a cheaper gadget, but for $400, I want this speaker to feel perfect. I’d want it to look perfect, too, but that useless little screen bugs me. If Bose removed the screen and all the buttons, I could at least focus more on the terrific sound quality of the Home Speaker. After all, it’s possible that Bose could fix the speaker grouping situation with a software update. I keep circling back to that price tag, though. Bose is famous for selling well engineered, highly customized speakers for too much money. (Somebody has to pay for the infomercials, after all.) In my opinion, the company is starting to fall behind in terms of innovation, though. Bose was once practically unchallenged in the noise-canceling headphones market, and in the past couple of years, Sony has frankly beat it by making better headphones. The smart speaker situation feels like an even more dramatic development in this department. That big $400 price tag can be fixed with a good sale. And it better be an incredible sale because a Sonos One costs $180, sounds almost as good, and is a hell of a lot easier to use.